Stocks Bull Market Over? Are the Bears About to Break...even? Bearish rhetoric is once more reaching extremes FOLLOWING the tumbling of stocks to new recent lows, a decline that many market commentators have once more latched onto as a consequence of Fed Tapering of QE or more accurately money printing, this despite the fact that the stocks soared in response to the last December Taper decision which was a surprise for the markets whilst the January Taper move was expected. 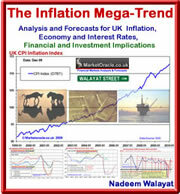 Whilst at the present time I remain firmly immersed in the analysis of the housing markets as I attempt to get my latest ebook in the exponential inflation mega-trend series completed this month, as I have plowed most of my wealth into the UK housing market since early 2012. However, I do still retain a sizeable 18% of assets invested in the stock market, so like most out there it would be useful to know whether the current sell off is a buying opportunity or not or whether it is an harbinger of the dreaded trend change that I have yet to acknowledge as a termination of the bull market trend that I have backed for the past 5 years duration of this stocks stealth bull market that began in March 2009 (Stealth Bull Market Follows Stocks Bear Market Bottom at Dow 6,470 ). 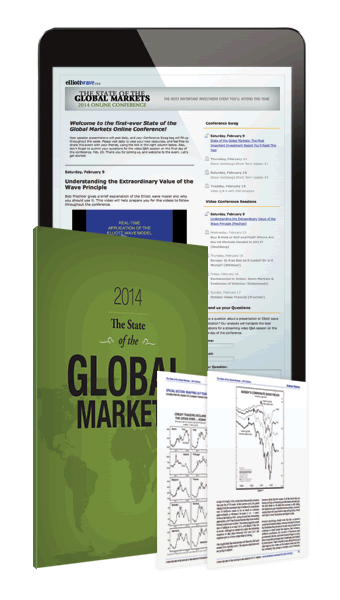 Where does the stock market stand in its oscillation around the trend forecast? The last close on the Dow was 15,699, which translates into a deviation from the forecast trend trajectory of 5.5%. Does a 5.5% deviation lend me to panic as many are doing in their inevitable proclamations of a NEW bear market ? NO, a 5.5% deviation does not even constitute a NORMAL correction, on its own it is another soon to be forgotten blip, just as was the one in October 2013, remember October ? Remember that blip that elicited intense bearish diatribe ? For now I'll let the bears crow loudly despite the fact that THIS corrective price action was seasonally EXPECTED, for soon they will be silenced, wiped out, CRUCIFIED until they once more emerge at depths of the NEXT stock market correction. Where do the Bears Break Even? Every other month we get a correction like this and once more the bears dutifully emerge to proclaim that this time the bear market has definitely started, however soon to go into hibernation once more when the next rally to new highs gets underway. However the question readers need to ask themselves when they hear such commentaries is that after FIVE YEARS, at what point would the perma-bears break even ? Dow 10,000 ? 6000? 4000? Yeah as low as that! DOW FORECAST - Current under oscillation of 5.5%, against earlier over oscillation of 4% is NOT abnormal. Oscillations can easily extend to 10% around the trend which currently extends to as low as Dow 15,000. ELLIOTT WAVES - My unorthodox interpretation of EWT implies that a significant correction is under way as the rally from the October lows comprised three distinct waves which implies it was corrective and also implies that as a worse case scenario the whole move could be re-traced i.e. back to Dow 14,800. MACD - MACD is heavily oversold which means a stock market bounce is imminent, though it would not mark the end of decline, so its going to be a tough learning experience for bottom hunting traders. TREND ANALYSIS - The Dow has broken 1 major support trendline and is bouncing off the second, however given the velocity of the decline to date the bounce looks temporary and thus the Dow looks set to break this trend line to target the third stronger trendline at 15,000, though that does not mean that is where the Dow will bottom i.e. it may only spike below Dow 15,550 to sucker more bearish sentiment. SEASONAL ANALYSIS - A DOWN JANUARY is usually a bad indicator for the stock market for the whole of the year i.e. implies a down year. This means that it is going to be tough for the stock market to reclaim and HOLD its recent all time highs as many demented bears will be piling in on the short-side by jumping on the Down January band wagon. So 2014 is NOT going to be a re-run of 2013, and instead from what I can see through the mists of time that it is more likely to resemble an upwardly sloping trading range. PRICE TARGETS - Upside targets are 15900, 16200, 16400, 16800, and 17000. Downside targets are 15,550 and 15,000. Which implies a lot of overhead resistance and less support, which again points to probability that we have not seen the low for the current move. Again, remember that this is my quick interim analysis as first I need to get the ever expanding housing market ebook out of the way, and then I have plenty more analysis to complete that I am doing in parallel such as on the Scottish Independence Referendum (big mistake for Scots as they look set to vote to jump over the economic cliff) and then the frenzy that will soon surround the run-up to the UK General Election (which I expect the Conservatives to win outright), but I will come back to take an in-depth look at the stock market by mid April at the latest. My existing stocks portfolio (18% of assets) is staying put so no panic here. My favourite sector for investing in 2013 - BIO-TECH (as stated in my last ebook of Feb 2013 - FREE DOWNLOAD) has soared, most holdings even after the current stock market sell off have tripled! So I want to buy more biotech stocks, about another 1% worth of assets if the general stock market indices take a further tumble, though its not certain that biotech stocks would follow suit, so to be blunt I would prefer MORE PANIC OUT THERE! So I CAN BUY MORE BIO-TECH for the long-run. What do I fear ? Yes, I am human, I do fear, and what I actually fear right now is that the stock market indices FALL HARD but the Biotech Stocks instead RISE! Which would mean having to consider BUYING at a higher price! and that would be painful! Also a reminder that the good people at EWI have made available a load of analysis that they say they normally charge $500 for to our readers for FREE! Your genetically modified stocks bull market analyst. Out of interest which Bio-tech stocks did you choose and what made you select those over others? Sorry, but I never give small cap stock picks. Stock market investing is from high to extremely high risk. The best starting point for investors would be ETF's and investment tursts (I don't like unit trusts cos they can print units too easily) such as BBH.